All that glitters isn't gold-sometimes it's silver. This twist on the age-old maxim was to plague U.S. coinage from its very beginnings. The ever-fluctuating prices of silver and gold, coupled with Congress' misguided coinage law and the Mint's internal problems, constantly frustrated efforts to keep an adequate supply of precious metal coins in circulation. This problem would last for years. The bimetallic standard instituted by the Coinage Act of 1792 defined the content of the standard gold dollar at 24.75 grains and the silver dollar at 371.25 grains. In 1792, this 15-to-1 ratio between the metals was in line with the world market. Within a few years, however, the world price of gold began to rise. The United States's largest gold coin, the ten-dollar eagle, was hoarded and melted as fast as it was minted. U.S. silver dollars, containing slightly more silver than the circulating legal-tender Spanish dollars, also saw melting and exportation, and even the fractional silver coins were affected. The situation got so bad that by 1804 President Thomas Jefferson ordered a halt to both eagle and dollar production. For at least a decade, except for half eagles and half dollars, which were primarily used in bank-to-bank transactions, mintages of all U.S. precious-metal coins were minuscule. From about 1800 to 1834, gold coins were rarely seen in circulation at all, and only Spanish silver pieces and fractional banknotes saw any appreciable use. By 1820 98% of the U.S. gold coin mintage had been destroyed. Fifteen years would pass before gold coins circulated again. In 1834, apparently to appease eastern banking and southern mining interests, Congress reduced the amount of gold in the standard dollar to 23.2 grains and changed the ratio to 16-to-1. With the prevailing worldwide ratio at that time of around 15.6 to 1, this had the effect of returning gold coins to circulation, as they were now worth marginally less than the equivalent amount of U.S. silver coins. The higher value silver coins should have gone into the melting pot, but a combination of factors, including vast imports of silver from Mexican mines and the return to circulation of U.S. silver coins that were formerly used as bank reserves, forestalled the inevitable for a decade. By 1844, though, U.S. exports of silver exceeded imports, and silver coins once again started to disappear. A few years later, things would really begin to get out of hand. Following the discovery of gold at Sutter's Mill in 1848, thousands of fortune-seekers swarmed to California, transforming it almost overnight from a sleepy U.S. territory, newly wrested from Mexico, into the nation's 31st state. The "Forty-Niners," and others who followed them, mined enormous quantities of gold, more gold than the world had ever seen up until that time. The output of the mines was just too much for the markets to easily absorb: Gold's price relative to silver began to fall, and then, melting and hoarding of silver coins took on really massive proportions. By 1853 it took $1.06 in U.S. gold coins to buy $1.00 in silver coins. U.S. silver coins practically vanished from circulation, leaving behind only an assortment of well-worn Spanish pieces and the tiny trimes (silver three-cent pieces), which had a metal content well below their face value. Congress was ultimately forced to address the problem. Extended debate ensued, mostly over the issue of debasing the coinage. Although gold coins were effectively debased in 1834, many legislators ignored this fact, as they vehemently protested lowering the amount of silver in the fractional coinage. Finally, a compromise was struck. This was the Act of February 21, 1853, whereby the amount of silver in the fractional coins was reduced by 6.9%, but the old standard was retained for the silver dollar as a sign of Congress' continued allegiance to bimetallism. The half dollar, quarter dollar, dime and half dime were affected by this change. To facilitate the withdrawal from circulation of the heavier, pre-1853 silver coins, a readily distinguishable change was needed; but to maintain confidence in the nation's money, it was thought necessary to retain the design of the coins then familiar to the public. Since 1838 the motif used on U.S. silver coins was the Seated Liberty design by Christian Gobrecht. It depicted Liberty, modeled after the British image of Britannia, seated on a rock surrounded by thirteen stars. On the dime, the reverse featured a wreath, with the inscription UNITED STATES OF AMERICA outside and the denomination ONE DIME inside. Officials decided to add arrowheads on either side of the date to identify the new, lower weight coins. Mint Director George N. Eckert instructed Chief Engraver James B. Longacre to modify the dies. The first Arrows dimes were proofs, part of five sets made of the new coinage. Regular production began in April of 1853, and the coins literally poured out of the mints. Out of a total of close to 21.5 million pieces minted from 1853 to 1855, Philadelphia made over 12 million in 1853 alone. Congress' plan evidently worked. For the first time in U.S. history there was an adequate supply of federal silver coins for commerce. For the most part foreign silver coins were quickly withdrawn from circulation and recoined into U.S. issues. While many of the first dimes of this type were initially hoarded, their appearance in vast numbers soon convinced the hoarders to release their stockpiles. The three-year series contains five date and mint combinations, as Arrows dimes were minted every year in Philadelphia (no mintmark) and in New Orleans (O) in 1853 and '54. Mintmarks can be found above the bow of the wreath. The 1853 Philadelphia issue appears with the most frequency in gem uncirculated condition, while the New Orleans issue of that year is the rarest of the series, particularly in mint state. The 1854-O also appears occasionally in high grade; a small hoard of about 18 pieces turned up in 1981. In addition to the first 1853 coins, an unknown but apparently tiny number of proofs were also struck in 1854 and '55. While all five issues are collected by date and mint, the main interest in this short series is from type collectors pursuing one of the five major varieties of Seated Liberty dimes. When grading this design, wear will first show on Liberty's knee, breast and head. On the reverse, check the highpoints of the bow and leaves. In 1856 Mint Director Eckert's replacement, James Ross Snowden, directed that the arrows be removed from the coinage, as very little of the old-tenor pieces remained in circulation. 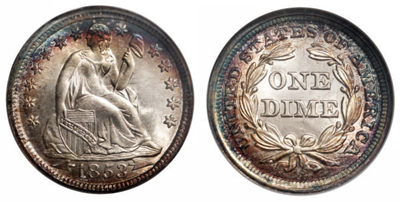 Seated Liberty dimes continued to be struck at the Philadelphia and New Orleans Mints, as well as at the newly built San Francisco Mint, until 1892, when the design type was replaced by Charles E. Barber's Liberty Head. BIBLIOGRAPHY: Ahwash, Kamal M., Encyclopedia of United States Liberty Seated Dimes 1837-1891, Kamal Press, Wallingford, PA, 1974. Breen, Walter, Walter Breen's Complete Encyclopedia of U.S. and Colonial Coins, F.C.I. Press/Doubleday, New York, 1988. Carothers, Neil, Fractional Money, A History of Small Coins and Fractional Paper Currency of the United States, John Wiley & Sons, London, 1930. Evans, George C., Illustrated History of the United States Mint, Revised Edition, Philadelphia, 1893. Greer, Brian, The Complete Guide to Liberty Seated Dimes, Virginia Beach, VA, 1992. Yeoman, R.S., A Guide Book of United States Coins, 47th Edition, Western Publishing Co., Racine, WI, 1993.